Oil stones are the traditional Western stones that many people grew up using. These stones are made from one of three materials (Novaculite, Aluminum Oxide, or Silicon Carbide) and use oil for swarf (metal filing) removal. The most traditional oil stones are natural stones made from Novaculite. These natural stones are quarried in Arkansas and processed to make what we call Arkansas Stones. These stones are separated into different grades related to the density and the finish a stone produces on a blade. The coarsest of them are called Washita. The Washita is not often used these days because it is very soft. The finer grades are called Soft Arkansas, Hard Arkansas, Hard Black Arkansas and Hard Translucent Arkansas. These natural oil stones can produce a polished edge, but tend to cut more slowly than man-made stones. The Hard Black Arkansas and Hard Translucent are more rare and are therefore more expensive. 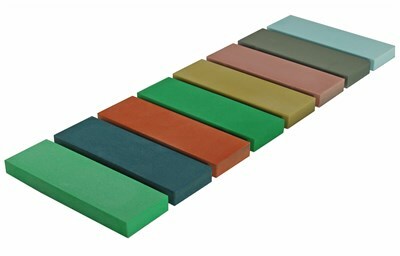 The Aluminum Oxide oil stones are a very popular man made choice. The most popular are called India Stone which are made by Norton. These stones can cut fast, and can also produce a fine edge on tools and knives. The grading system for these stones is generally labeled fine, medium, and coarse. These stones are often brown or orange in color. When compared with the Arkansas stones, Aluminum Oxide (India Stones) are more coarse. The India Stones are used in conjunction with Arkansas Stones to cover all levels of coarseness. The fastest cutting oil stones are made of Silicon Carbide. The silicon carbide stones made by Norton are called Crystolon stones. These stones are also labeled fine, medium, and coarse. They are usually gray in color. While these stones will not produce an edge as fine as the India or natural stones, the fast cutting makes them ideal for initial coarse sharpening. Because they sharpen quickly, it a common practice to use the Coarse Crystolon and then progress to an India Stone and then to finish up on an Arkansas Stone. The good overall performance and the lower price are the oil stone’s greatest assets. A set of India or Crystolon stones are the least expensive stones to purchase. The natural Arkansas Stones vary in price from the very economical Soft Arkansas to the more expensive Hard Black and Translucent Arkansas Stones. These stones are also relatively hard, so the stones rarely require flattening. The main disadvantage of the oil stone is its slower cutting rate. Of the three main stone types, the oil stone is the slowest. The fact that oil is used to remove the swarf is also messier to clean up than water. Water stones are relatively new to the Western world, but have gathered a large following due to their many advantages. Like the oil stones, the water stones are available in both natural and synthetic materials. However, due to availability, only synthetic stones will be discussed. Synthetic water stones are generally made of Aluminum Oxide. This is the same abrasive material used in the India stones. 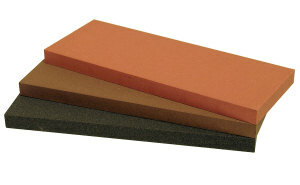 However, the difference between the two is the binder that holds the abrasives in the water stone together. Water stones are softer than India stones, which promotes faster cutting because the old abrasive material breaks away and is replaced with fresh sharp material. Fast cutting is clearly an advantage of the water stone. The other obvious advantage is the use of water rather than oil to remove the swarf from the stone. However, the water stone is not perfect. The softness that promotes fast cutting also wears the stone down more quickly. This tends to wear the stone unevenly, which requires flattening to bring the stone back into shape. Diamond stones contain small diamonds attached to the face of a metal plate. These small industrial diamonds are much harder than any of the other sharpening stones. However, not all diamond stones perform the same function, nor are they always created equal. There are two main types of diamond stone styles. 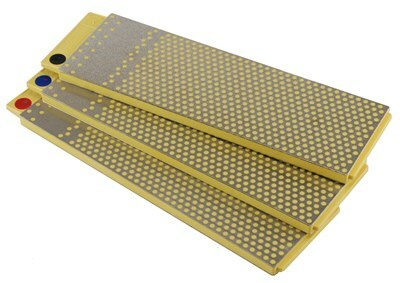 The more common style contains holes in the diamond surface to capture the swarf. These stones cut very fast and are very simple to use. The next type is the continuous diamond surface. These stones are preferred when you are sharpening tools with points that might get caught in the recesses of the non-continuous diamond surface. Both types of diamond stones are available in mono-crystalline and poly-crystalline diamonds. The mono-crystalline diamonds are more desirable as they will last longer. The two greatest advantages of the diamond stone are the very fast sharpening and the flatness that is retained by the diamond stone. In fact, extra-coarse diamond stones are often used to flatten oil or water stones. The main disadvantage of the diamond stone is its initial cost. While these stones are the most expensive, they will also last a long time, so the long-term cost can be comparable to other stones. 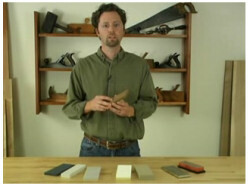 There are good reasons why there are different types of sharpening stones available. There is not one type of stone that is best for everyone. Selecting the right one starts by finding the stone with the best combination of advantages for your particular sharpening needs. 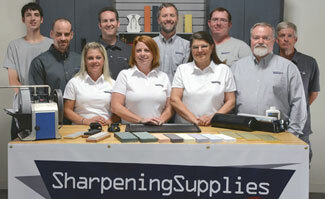 Questions about types of sharpening stones?